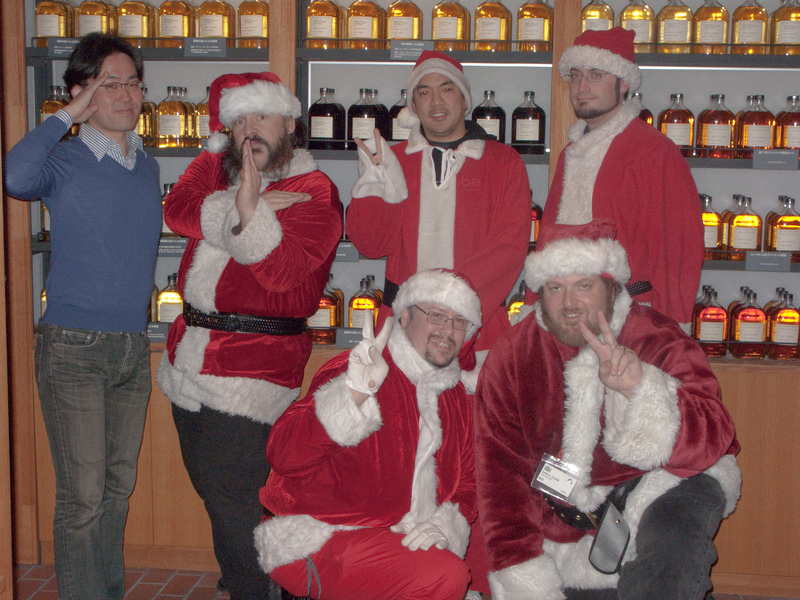 The day after SantaCon we met Nori, our Man in Osaka for a tour of the Suntory Yamazaki distillery near Kyoto. We took the Hikari #505 from Tokyo to Kyoto then transferred to the Kyoto line for the trip to Yamazaki Station where Nori met up with us. Nori is a great guy who showed us around Osaka and the Nissin noodle museum last year. 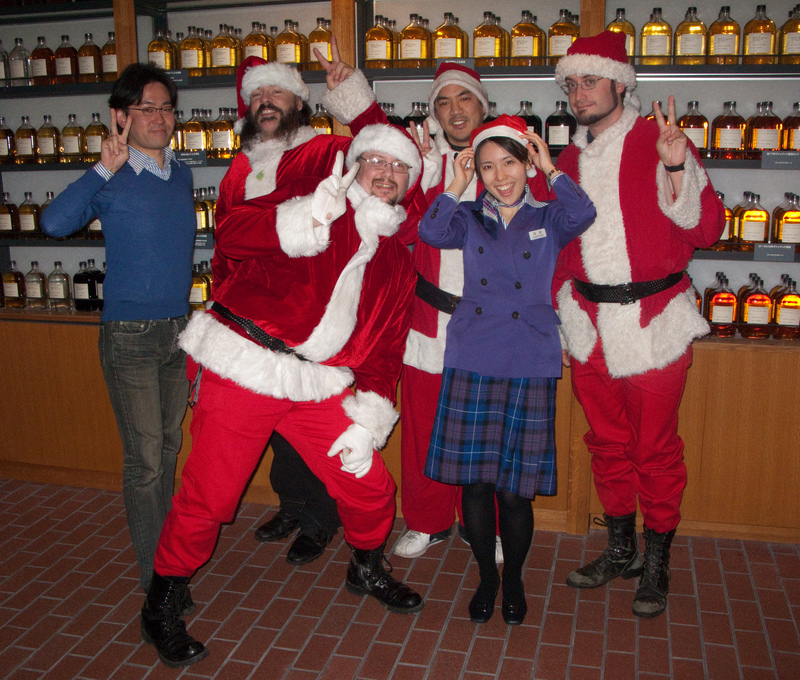 After the distillery tour we visited the whisky tasting room where we sampled Yamazaki and Hakushu 12 year old whisky. It was delcious. The Yamazaki is one of the smoothest most drinkable whiskies out there. My friend Satoru Shimizu arranged a gift of 10 year hakushu in a very nice bottle for me and my friends. After the tour we hit the gift shop with gusto, procuring several expressions of Suntory products that you just can’t find in the states including a cask strength 15 year old and several cask strength sample expressions, each aged in a specific wood meant to be a component in the final Yamazaki or Hibiki product. I also picked up a small bottle of the corn grain whisky they use in the Suntory blends. After shopping we went downstairs to the Yamazaki Whisky Library and tasting bar. I wish I could get a library card and check out bottles from this library. It’s an amazingly extensive library of whisky from all over the world. I guess I’ll just have to be content with photographic evidence for now. We spent a couple of hours and quite a few yen trying out the different whiskies available with The Yamazaki 25 year old at one end of the spectrum and the New Make at the other end. It was a fine time and by the end of the afternoon we’d worked up quite an appetite so we revisited Aoki-san, the Taisho at my favorite restaurant in Kyoto called “Okariba” for some of his Omakase specialties. You can see my earlier post about Okariba here. As much beer as we could drink. We made it back to Kyoto station in time to catch the last Hikari Shinkansen of the evening back to Tokyo. We called it a night since we had to get up early for our flight to Okinawa the next day.